This wonderful quilt was done for a lovely customer who ordered a custom quilt from my etsy shop to give her daughter as a graduation gift. She requested something timeless but made up in her daughter's favorite colors - aqua, red and pink - and she wanted it to become something her daughter could pass on to her daughter. I have to say that this may be one of my favorite all time finishes. 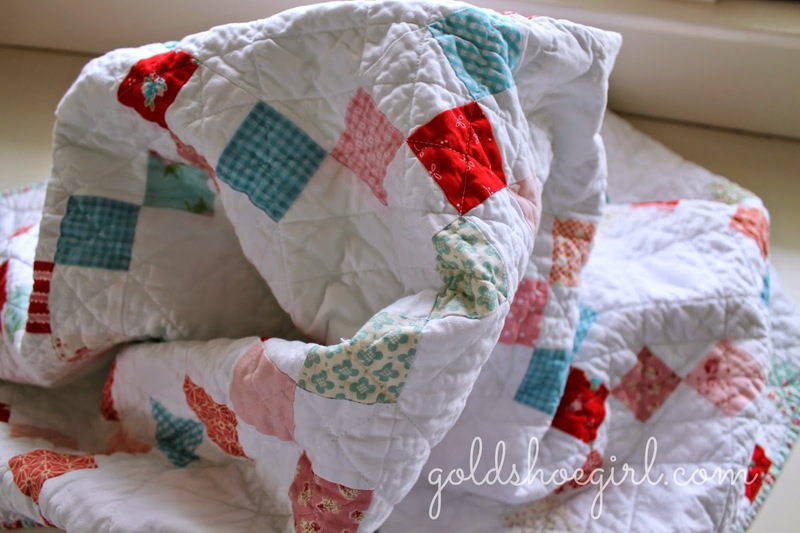 I love the pattern, the colors and the quilting. My new sewing room came with this quilt hanging rod and hooks all set up. The only thing is that it is not in very good spot for taking pictures. It's a fairly dark corner and a little awkward to get the right angle. I'll use it for now because it is better than laying my quilts on the floor and standing on a chair to get a full view shot. But, I have to say, the quilt is way more beautiful in person than in that view above. We used over 20 different fabrics in the little patchwork squares. We tried to choose prints that would be classic and not trendy. 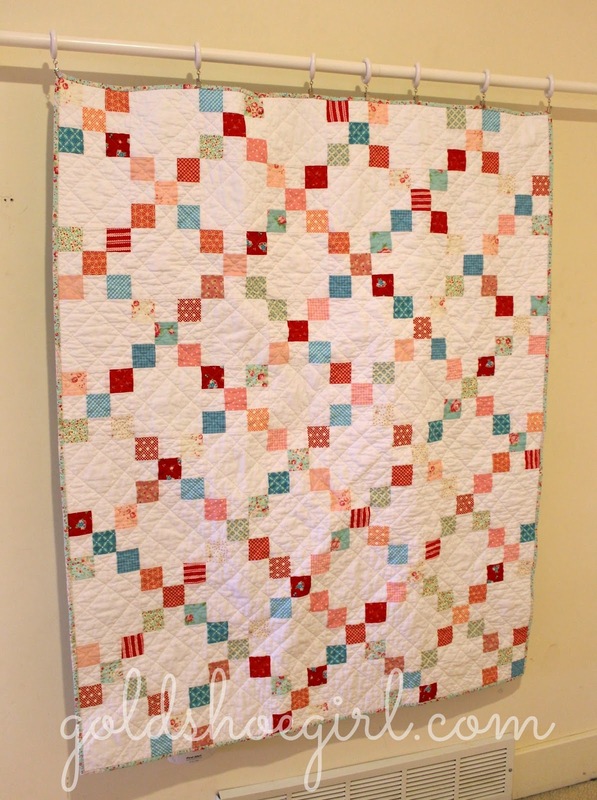 The back of the quilt is a single print by Dena Fishbein called Daisy in Aqua. It totally captures the vintage heirloom vibe we were going for. 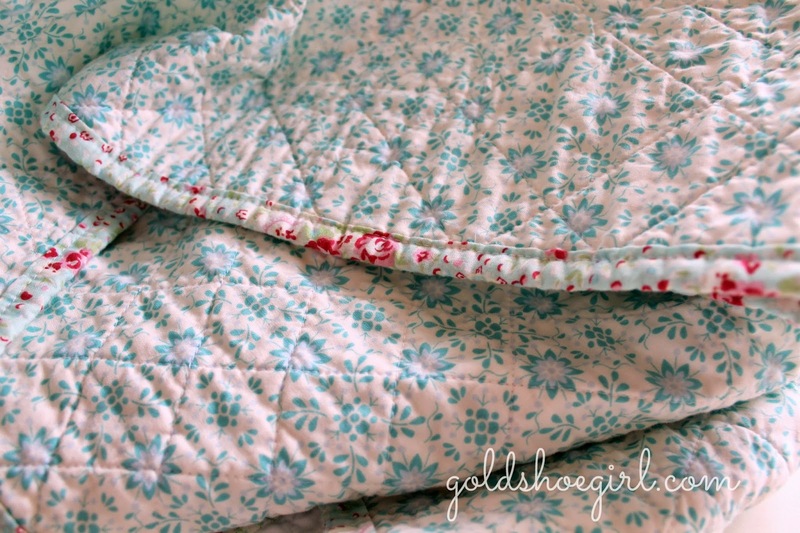 The binding was machine sewn on and is Tanya Whelan's Paisley Rose in Teal. It's just perfect. I machine quilted it like usual in diagonal lines across each patchwork square which created that wonderful diamond pattern on the back. 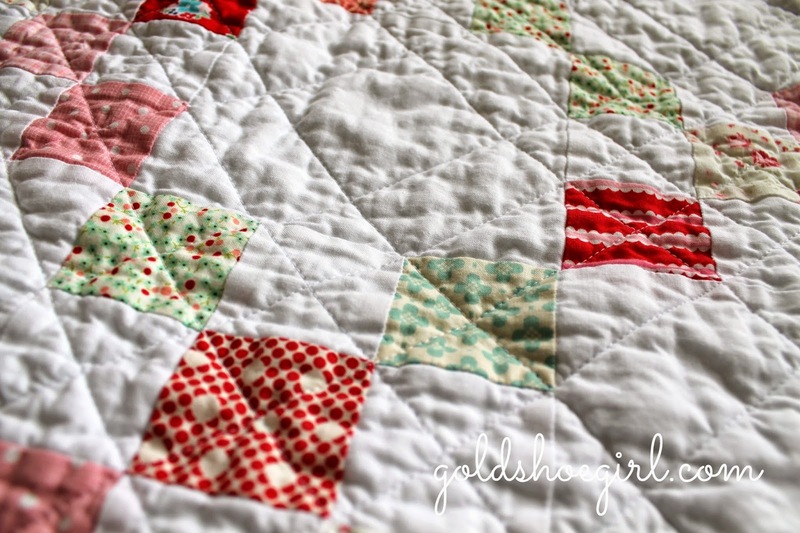 The quilting really looks great in the white background squares. 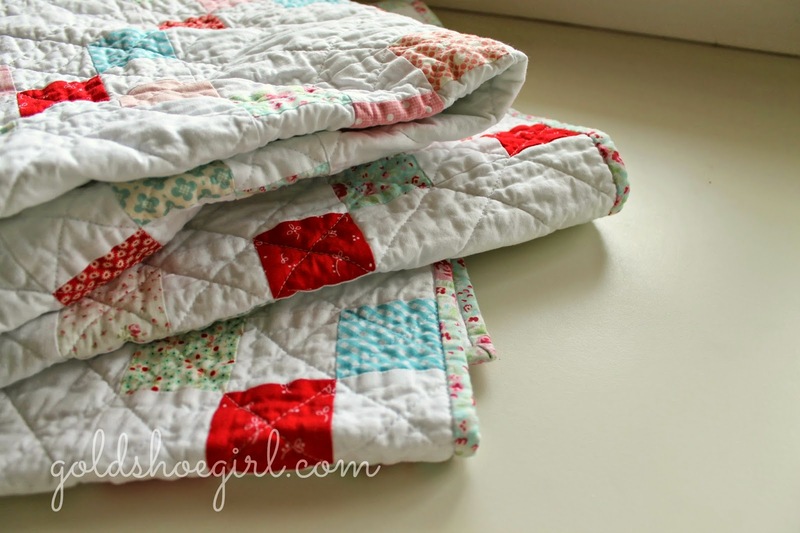 This quilt was hard to send on its way because I just love the style and aesthetic of it so much. And then washing it just made it that much harder because it puckered up so perfectly. It was very tempting to cuddle up under it myself this weekend - but I resisted - just barely:). Gorgeous! I love it too! Super fabric choices. We spent a lot of time trying to pick just the right ones - thanks for noticing!!! Anna - you picked out 3 of my favorite design ideas - simple, classic, elegant - can't ever go wrong with those! I think this is truly beautiful and all my favourite colours too!! 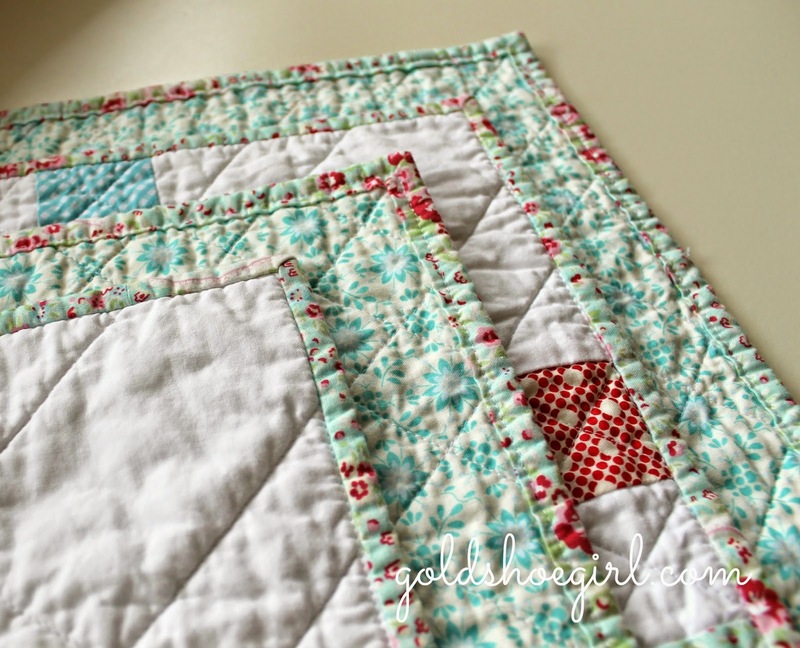 that color combo is one of my favorites, and I love irish chain quilts. so pretty! 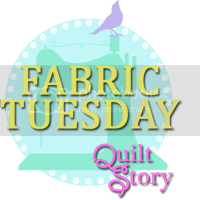 Thanks for linking up with Needle and Thread Thursday!